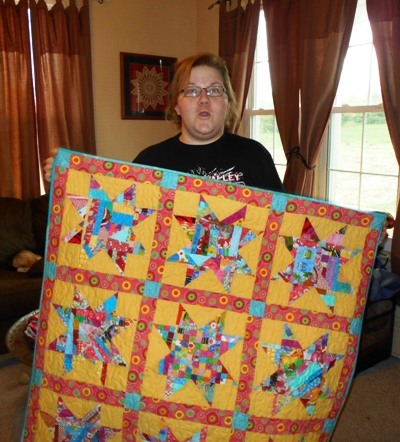 The Blogger’s Quilt Festival hosted by Amy and Amy’s Creative Side totally caught me off guard. Since we’ve been working on our new book we’re writing (read about that here), we’ve been on survival mode only doing the things that absolutely needed to be done. If you don’t know about Blogger’s Quilt Festival, you can learn more about it by following the link. It’s a on line quilt show of sorts that you won’t want to miss. As long as I was posting pictures of the quilt I decided I might as well write up a pattern. You’ll find a link to it at the bottom of this post. One of those things that absolutely needed to get done was to get a baby quilt made. Close friends of ours had a baby about two weeks ago, a little girl named Peyton…well every little girl needs a baby blanket so I needed to sew. I had the worst time trying to take some pictures…no one would cooperate. …including Kelli. She was in a silly mood and just as I was about to click the camera, she’d move the quilt and yell, “Boo”! In my form of revenge, I am posting the picture. I was surprised with my choice but I used a variegated thread on the top. I actually liked it a lot. Like I said, we were pressed for time so I didn’t have time to go to town to select fabric….what I had is what she got. 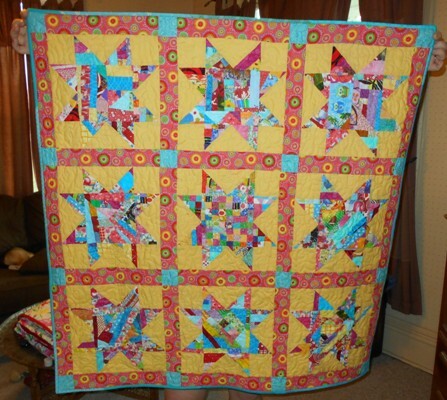 The center block is made from 1 1/4″ strips sewn together. Here’s another block. This one made me laugh to see. There is a football in the fabric and red had ladies all in one block. 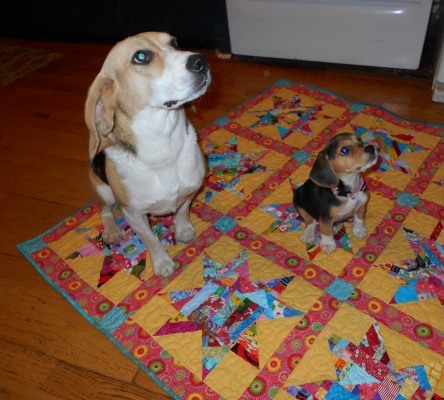 We did take a moment to try to teach Betsy the art of sitting on quilts. She did pretty good. If you’re interested in making a quilt like this we wrote up the pattern. It’s real simple. 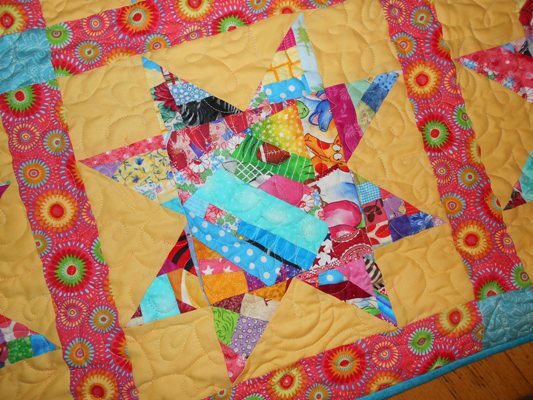 You can get it by following this link Scrappy Star Baby Quilt. ( you do need an Abode Reader to view it. You can find that here.) I will put a link to the pattern over on the right hand column of the blog with the other tutorials so you can go back and find it later. The baby quilt is off with it’s new owner. It was fun to sew something just for fun. 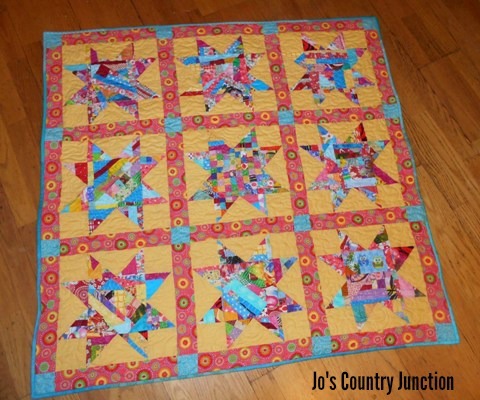 This entry was posted in Finished Projects on May 16, 2014 by Jo. Quilt looks lovely. Love the bright made fabric. Has a Victoria F Wolfe look. Cute picture with “Mini Me Dog”. Beautiful quilt, cute puppy and goofy daughter. Perfect combination! Gorgeous quilt. Looks popular with the family too! Cute! 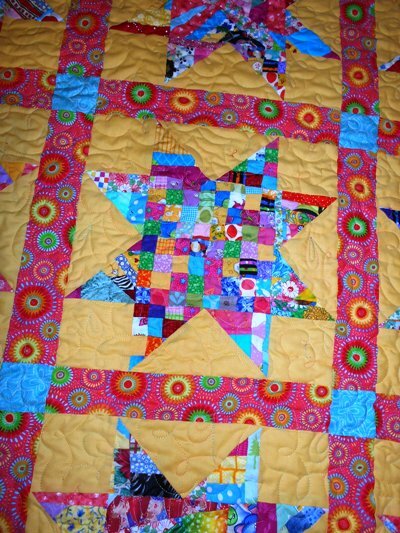 Love those scrappy stars! Adorable quilt! Thanks for the great, concise instructions! Can’t wait to make it. A correction has been made to the original instructions. We had a typo. Sorry for the confusion.